Sixty-seven more digital ad screens will be added at 23 more stations by the end of September. The digital screens showing ads for 5, 10 or 15 seconds bring in more revenue than the traditional billboard-style displays. WASHINGTON — Metro riders will see many more digital ads in the coming years, regardless of whether the agency sells naming rights for key stations. The stations that appear to be most promising for naming-rights deals are Gallery Place, Navy Yard, Metro Center and L’Enfant Plaza, Metro staff believe, given their high ridership and prime locations. In Philadelphia, naming-rights deals have brought SEPTA about $1 million per year, but Metro staff have not yet determined a current estimate of what Metro could expect. In 2012, most riders surveyed by Metro opposed selling station names, preferring names that clearly identified station locations. If the Metro Board changes policy to allow the sale of naming rights, it could provide a significant jump for Metro’s advertising revenue. Only 1.3 percent — $24 million — of Metro’s budget comes from all Metro advertising sales, so as Metro tries to scrape together more cash, increasing ad sales is one of several key targets. 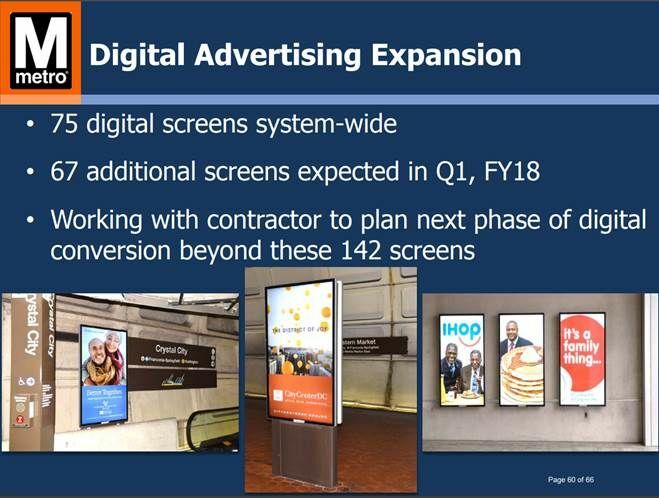 Metro plans to add 67 more digital ad screens at 23 more stations by the end of September. Twenty-two other stations across the system already have a total of 75 other screens. The digital screens showing ads for 5, 10 or 15 seconds bring in more revenue than the traditional billboard-style displays. “WMATA is also actively in discussion about how to convert the remaining 542 backlit dioramas into digital platforms in rail stations, as well as reviewing the power requirements to add new inventory at stations where advertising demand is highest,” said documents prepared for the Metro Board. Plans are for future stations — Potomac Yard on the Blue and Yellow lines and the Silver Line stations under construction in Fairfax and Loudoun counties — to have completely digital platforms. Even before that, additional screens are planned by the end of this year near the fare gates at Reagan National Airport and Union Station, which could provide interactive information about how much each trip costs riders. Staff note Metro has some other small income streams too, including Metro-branded merchandise. A roadblock to increased funding from advertising is the continuing decline in ridership — advertisers are not willing to pay as much to reach fewer people. Metro has also given up a significant amount of ad sales by banning advocacy advertisements in an effort to limit controversy. “As more advertising has shifted to an advocacy focus postelection, revenue has been further impacted,” said documents prepared for the Metro Board. The contractor that runs Metro’s advertising program in exchange for a cut of the sales regularly sells out advertising in the Pentagon station for about $100,000 for a four-week period, while the other 11 stations — where advertisers can pay to blanket the station with their message — are not quite as popular. The presentation did not address potential opportunities to increase ad revenue across the bus system, where ad space above the seats on many buses often sits empty.